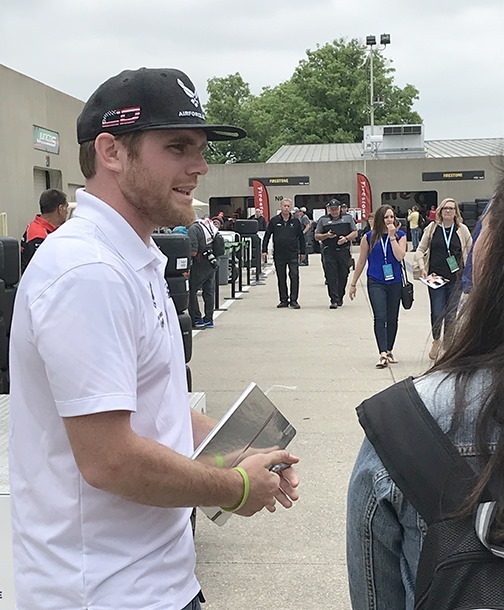 Every May I see many fans sporting a Bronze Badge, which for $150 grants you Gate Admission, Garage Access, and Gasoline Alley for every day in May except on race day for the IndyCar Grand Prix and The Indianapolis 500. 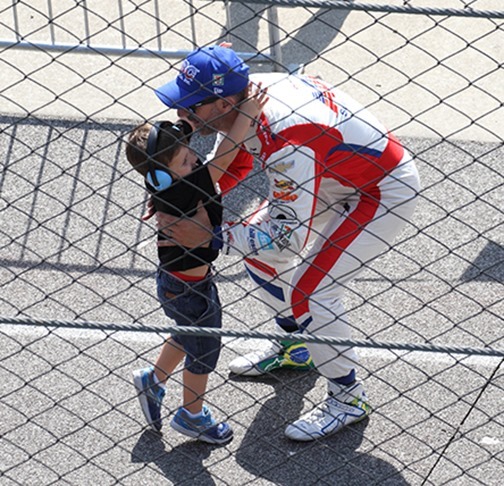 You can even purchase a Junior Garage Credential for kids from the age of 9-17 for $75. 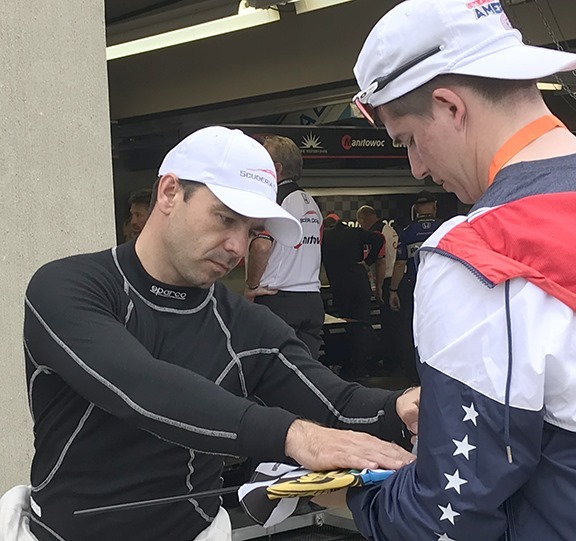 For the ultimate fan, this year IMS offered a Silver Badge for $500 and for an additional $1000 you could upgrade the Silver Badge to a Pre-Race Pit (Cold) Pass for both the INDYCAR Grand Prix and the Indianapolis 500—you must be over 18 years old to participate in this special experience. 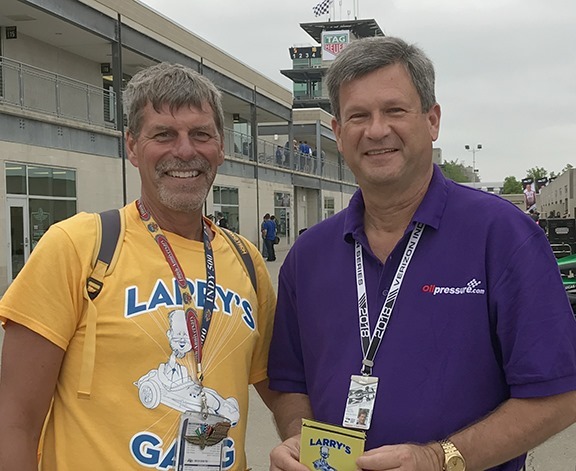 Silver Badges will be honored at the Indianapolis Motor Speedway for gate admission, garage area access, and Pit Lane access May 11, May 15-21, and May 25-26, 2018, during public gate hours and as directed by IMS personnel. (Race Day tickets are required on May 12, and May 27.) It sounds pricey, but they were sold out for the 2018 Month of May. So if you ever wondered what it was like to stand on the “other” side of the fence—this is your chance (but you’ll have to wait until next year for the Silver Badge). What it really buys you is access to the drivers, who are the friendliest and most accessible athletes in the sporting world. 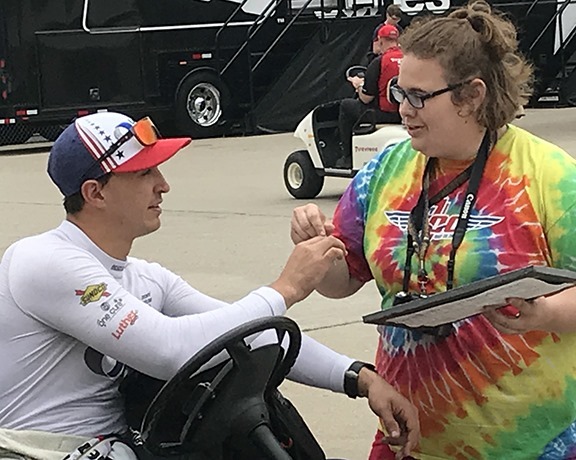 Even on high-stress days, they stop and sign autographs and interact with the fans. 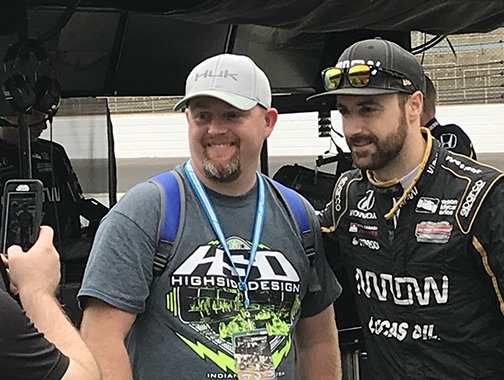 IndyCar drivers seem to understand that the fans make the sport. 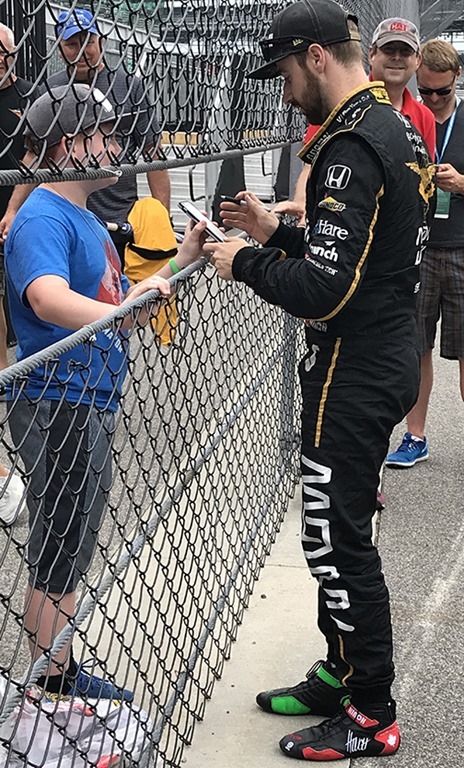 I’ve seen drivers stop and sign autographs after a most stressful qualifying experience or a bad practice. A perfect example happened Friday. We were roaming the garage area and came across someone who recognized George. He approached us and gave us two drink koozies labeled Larry’s Gang. George asked him to tell us about Larry’s Gang. Larry is his dad, who is now in his 80’s. He has been to every race since 1956. It is now a family event to come here every May. The family is scattered in Indianan, Chicago and other places, but they all get together in their seats in Turn Three. They even have their own website and Twitter account. You can follow them on Twitter at @GoLarrysGang or check out their website here. 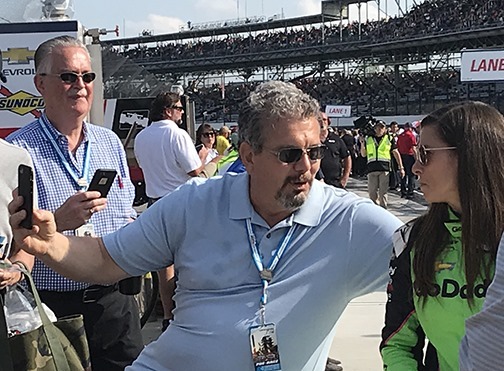 Of course, the best days to attend are the weekends leading up to the Indianapolis 500, they have long been my favorite weekends to attend. The electricity is still in the air, as it is when you enter the gates, but the atmosphere is much more laid back than on race day. So the extra money for a Bronze/Sliver Badge is really worth it if you are more than a casual fan. 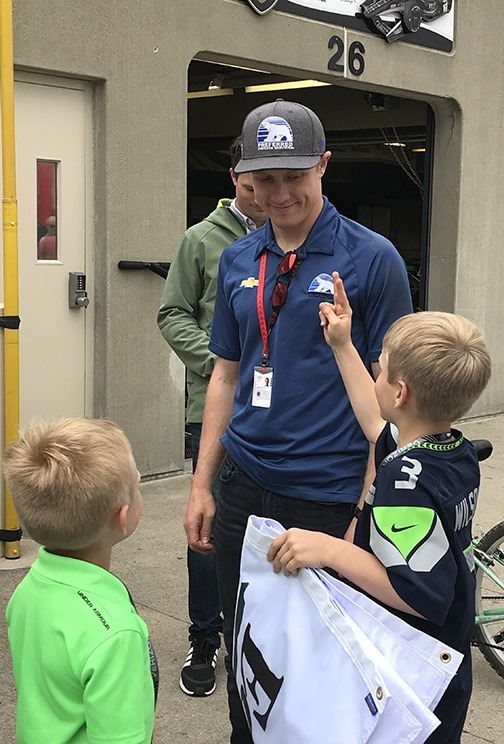 You can catch moments with the drivers that give you insights into their love of racing and the bond they have with their families and teams. 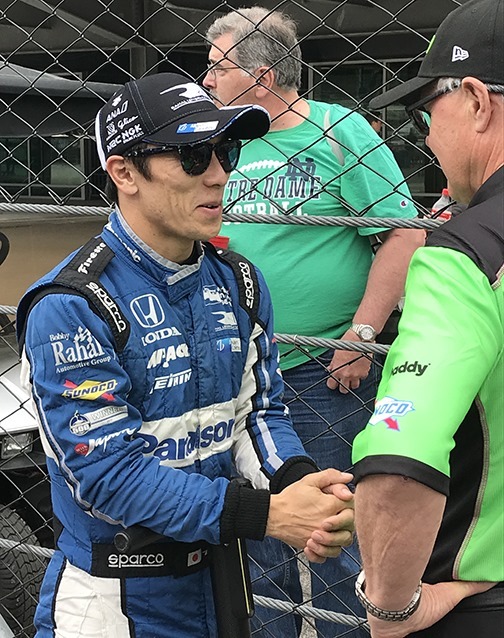 This entry was posted on May 20, 2018 at 11:55 am and is filed under Indianapolis 500. You can follow any responses to this entry through the RSS 2.0 feed. You can leave a response, or trackback from your own site. Thanks Susan. I always wondered how these passes worked. Hopefully, I will be able to buy and use one next year. Bronze Badge is a great deal. Personally I don’t feel like the Silver Badge is worth the money. The only thing it offers over the Bronze Badge is access to the pits and while that is cool it’s often very crowded and if the drivers are out there they’re usually busy with race stuff, so not really worth the $350 extra in my opinion. Plus they usually allow Bronze Badge holders into the pits one day of the month so you can get a taste of the pits on that day for no extra charge. The Bronze Badge is great though, and if you buy early you can get it for a little cheaper ($135 I believe). 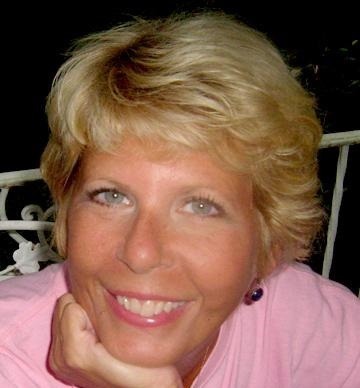 Thanks for the article Susan!